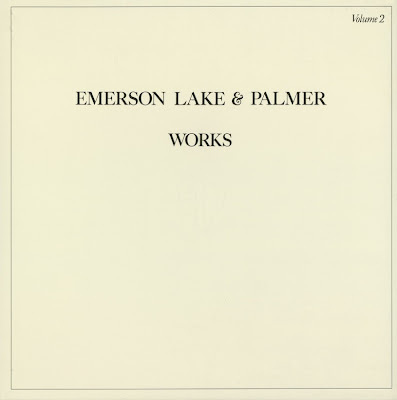 Works Volume II is an album released in 1977 by Emerson, Lake & Palmer. Unlike Works Volume I (which consisted of three solo sides and one ensemble side), Volume II was a single album which seemingly was a compilation of leftover tracks from other album sessions that had not made those albums. While many derided the album for its apparent lack of focus, others felt it showed a different side of the band, with blues, bluegrass and jazz being very prominent as musical genres in this recording. "When The Apple Blossoms Bloom...", "Tiger In A Spotlight" and "Brain Salad Surgery" had been recorded at the 1973 sessions for the album Brain Salad Surgery but did not appear on it - rather strangely in the case of the latter. Volume II also included a stripped-down version of Greg Lake's "I Believe in Father Christmas". An orchestral version of the song had previously been released as a solo Lake single in the UK and became something of an annual Christmas standard there.